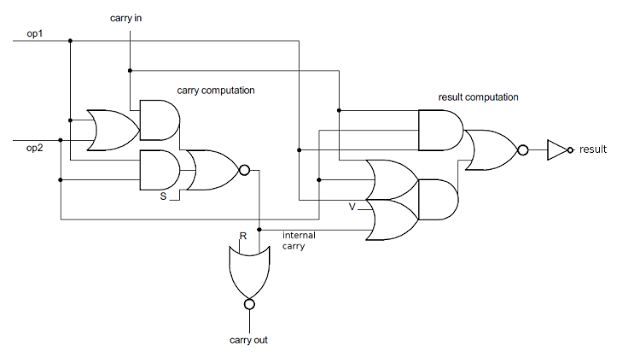 There is an issue with the layout of the OR gate that takes V and the internal carry as inputs: I don't think it should be connected to op2. Anonymous: yes, that line is positioned ambiguously; it should be connected to the top OR gate, not the bottom one. I have a hard time drawing multi-level gates with Eagle. Can you explain why the op latches have bidirectional connections to the ALU low bus and ALU high bus? Do the values here need to get read out without going thru the ALU in some circumstances? In your detailed schematic, the bit select logic seems wrong. You are showing bits 1 and 5, shouldn't it be bits 2 and 6? Anonymous, I'm glad my schematic is getting studied in detail. I think the bit select logic on the far right is correct. The upper NOR gate is active if /i5 is 1, /i4 is 0, and /i3 is 1, i.e. the instruction is xx010xxx, which is 2. The lower NOR gate is active if /i5 is 0, /i4 is 0, and /i3 is 1, i.e. instruction xx110xxx, which is 6. On bitslice 0 of the ALU, is Carry In set to S so that the XOR works correctly on that bit of the word? (I guess it's S OR Cin from previous ALU operation). I haven't figured out the carry-in circuit yet, but based on the 8085 Regarding the carry in: I haven't figured out that circuit yet. I expect it to be slightly complicated since it depends on the instruction (e.g. add vs add with carry need different inputs). In the 8085 the carry-in also needs to be set appropriately for rotate left and rotate left through carry. Since the Z-80 does rotates differently, that won't be the case. 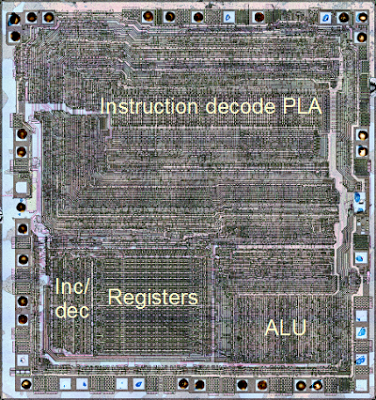 This is very cool - both how the 8-bit CPU actually has a 4-bit ALU, and the fact that you've reverse-engineered it all by staring at photos of the silicon. I'm in the midst of designing my own custom 4-bit CPU from 7400 logic, so it's interesting to see another relevant example. I thought I knew the ins and outs of the venerable CPU, but you proved me wrong. Well done, nice work! What about the 16-bits operations? Are they executed as four 4-bits operations? I see it now, I misread the double inversion logic. This and the 8085 teardown are excellent. I am looking forward to implementing this in an FPGA, then optimizing it for performance instead of the original need for minimal gate count. BTW: I started designing PCs based on the NEC uPD780 more than thirty years ago, at NEC. The Z80 still is my favorite. No longer Anonymous. BTW, did you find in the layout any of the transistor traps (fake, always on, depletion mode transistors intended to dificult reverse ingeeniering) Masatoshi Shima mentioned? I wrote this in 1989, I didn't have access to the silicon implementation but to keep the half carry it made sense that it should be so. Most of 8-bit CPUs have an 8-bit ALU, so I don't understand what is the avvantage to use a 4-bit ALU to perform 8-bits operations. Good job with the reverse engineering. I really like your articles about the z80. You stated that "Not shown in the block diagram are the simple circuits to compute parity, test for zero, and check if a 4-bit value is less than 10. These values are used to set the condition flags." Can you please explain how the zero flag is generated? I suppose it is a NOR of all the bits. But since the ALU is 4-bits is the zero flag generated from the 8-bit result? or is it generated from each nibble and then put together, like if there was a "half"-zero flag. good job ! it allowed me to implement this ALU using minecraft redstone. 1)the last gate should be a OR gate instead of a NOR. 2)to perform a OR computation, R=0 (and not 1 as mentionned), S=1 and V=1. It's been mentioned a few times that other CPUs such as the 6502 have 8-bit ALUs. The 6502 ALU is actually a pair of 4-bit ALUs daisy chained together. 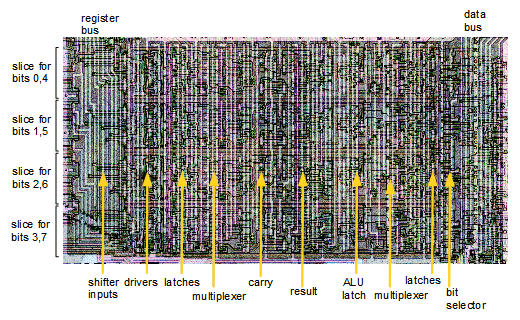 You could say the Z80's processing path that requires a second lap through its 4-bit ALU via latches to handle larger words (or three additional laps for a 16-bit word) is simply unrolled one lap in the 6502's silicon to achieve an 8-bit unit. The 6502 would face some additional challenges also were it to have had a monolithic 8-bit ALU since the paired 4-bit nybble ALUs provided an intermediary half-carry on the first nybble that permits a fast carry decider (multiplexed between binary/bcd carry) and fast decimal adjust on the low-order nybble for its patented BCD optimization to work the way it does. With a monolithic 8-bit design the decimal adjustment would have had to have been done in a separate stage to the full 8-bit add/sub output consuming additional cycles.